Their mandate is to build transformational leaders while aiming at inculcating a culture of innovation, built on a foundation of character, with a focus on delivering excellence in all that they do. 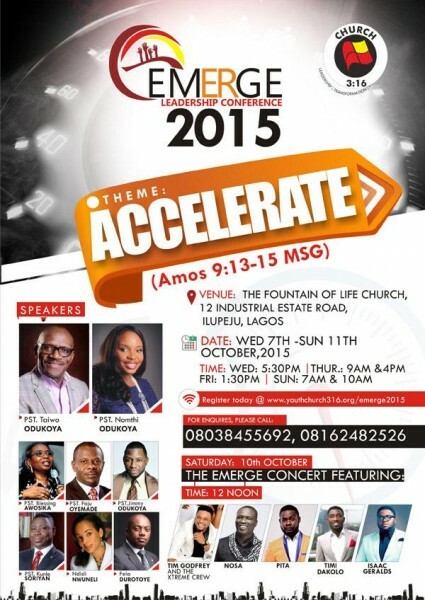 One of the ways they intend to achieve this is through the Emerge Conference. 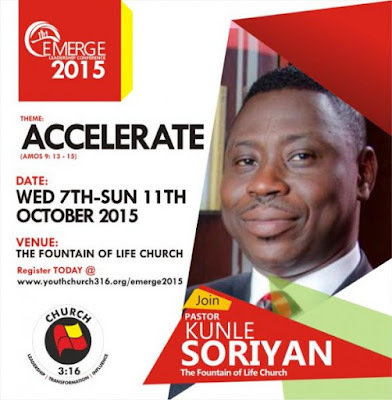 The essence of the Emerge Conference is to shape the future of the nation by empowering its youths. The young people of today are already emerging as the future leaders of tomorrow. Through this conference, Church 3:16 will act as a conduit, supporting the emergence of a new breed of godly groundbreakers that will change this nation for the better. 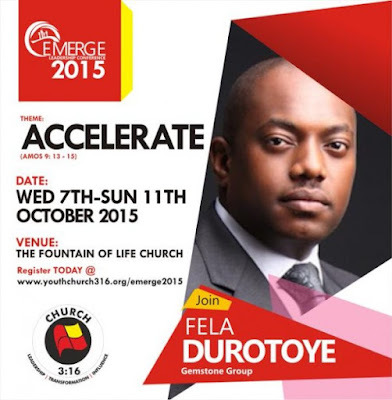 Speakers are Pastors Taiwo & Nomthi Odukoya, Pastor Ibukun Awosika, Pastor Poju Oyemade, Pastor Jimmy Odukoya, Pastor Kunle Soriyan, Ndidi Nwuneli, Fela Durotoye. Saturday, October 10th will also see Church 3:16 host “The Emerge Concert” which will feature an array of anointed and talented artistes: Tim Godfrey & The Xtreme crew, PITA, Timi Dakolo, Nosa & Isaac Geralds. *** Register for THE EMERGE LEADERSHIP CONFERENCE before SEPTEMBER 30th & you stand a chance of winning a BRAND NEW iPhone 6. The winner will be announced during the conference opening ceremony on October 7th.